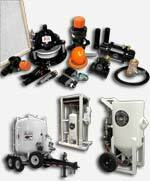 The Pirate Brand® Dry Land™ line of air dryers is an ideal solution for mobile blasting contractors. Wet compressed air clogs blasting pots and compromises the quality of the blasted substrate by putting moisture back on the surface. The moisture then flashes to rust, necessitating costly re-work. 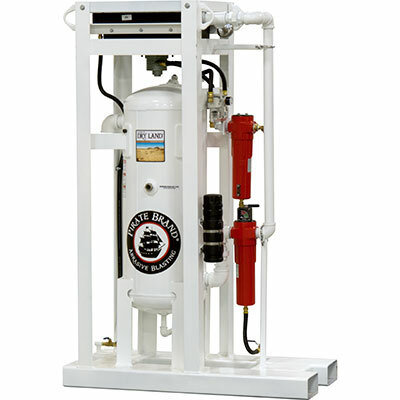 Pirate Brand® Dry Land™ Single Tower, Deliquescent, Air Dryers are a skid mounted system which includes an after cooler, a coalescing filter, and a single tower dryer filled with desiccant tablets. Warm compressed air enters the aftercooler where it is cooled to a 10°F to 15°F (5.6°C to 8.3°C) approach to ambient air temperature, water is condensed out during this cooling process. The saturated air and liquid water pass through a coalescing filter where any oil contaminants from the compressor are removed and then proceed to the inlet of the dryer tank. The water and any solid particles present are separated by gravity and fall to the bottom of the dryer tank. The air moves up through the desiccant tablets which absorb the moisture from the air dropping the relative humidity before it flows through the dryer outlet. The tablets dissolve gradually as they absorb the moisture. The dissolved desiccant and water falls to the bottom of the vessel. The dryer must be drained periodically to remove the accumulated solution. A manual ball valve is installed for this purpose.